America’s 60,000 pig farmers and their veterinarians are ending 2018 with recognition of their diligence to use medically important antibiotics in a strictly responsible way. 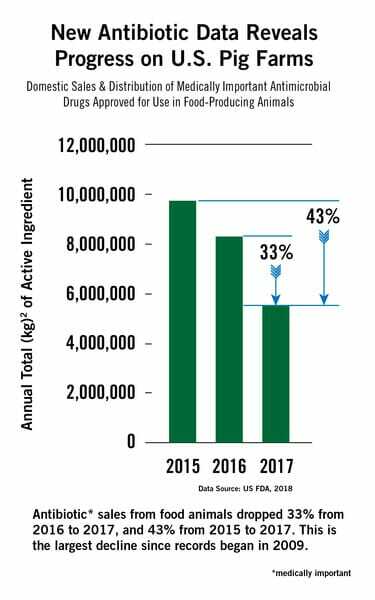 The US Food and Drug Administration’s newly published Annual Summary Report on Antimicrobials Sold or Distributed for Use in Food-Producing Animals cites 2017 data that shows a 33 percent decline in this most critical class of antibiotics intended for use in food animals. When added to the decline found in the 2016 data, it confirms a reduction of 43 percent in this class of antibiotics from the 2015 level. As an example of this cooperative approach to antibiotic stewardship, the National Pork Board, along with the National Pork Producers Council, recently announced a partnership with the Farm Foundation, The Pew Charitable Trusts and many others to introduce a comprehensive framework to strengthen antibiotic stewardship to protect animal and public health. The stakeholders agree that the use of medically important antibiotics in all settings, from human health care to livestock production, must be carefully managed to slow the emergence of resistant bacteria and preserve the effectiveness of vital drugs. The framework defines effective stewardship, outlines its core components and describes essential characteristics of effective stewardship programmes, including key performance measures. In addition to the two pork groups, organisations that agree with the framework include: Elanco Animal Health, Hormel Foods, Jennie-O Turkey Store, McDonald’s Corporation, National Milk Producers Federation, National Turkey Federation, Smithfield Foods, Inc., Tyson Foods, Walmart Inc. and Zoetis. The 15 core components of the antibiotic stewardship framework are based on the importance of veterinary guidance and partnership, disease prevention strategies and optimal treatment approaches, as well as effective record keeping and a culture of continuous improvement and commitment to antibiotic stewardship. The components address education, implementation and evaluation steps for phasing in stewardship programmes. The framework’s guiding principles are intended to help ensure that stewardship programmes have a clear scientific basis, are transparent, minimise the risk of unintended consequences, encourage alternatives to antibiotics and focus on long-term sustainability. The National Pork Board has responsibility for Checkoff-funded research, promotion and consumer information projects and for communicating with pork producers and the public. Through a legislative national Pork Checkoff, pork producers invest $0.40 for each $100 value of hogs sold. Importers of pork products contribute a like amount, based on a formula. The Pork Checkoff funds national and state programmes in advertising, consumer information, retail and foodservice marketing, export market promotion, production improvement, science and technology, swine health, pork safety and sustainability and environmental management. For information on Checkoff-funded programmes, pork producers can call the Pork Checkoff Service Center at +1 (800) 456-7675 or click here.